In the main event at The Theatre at New York's Madison Square Garden, Ivan Calderon of Puerto Rico, improved to 34-0-1 (6), with a unanimous decision to retain his WBO Flyweight Title over challenger Jesus Iribe of Mexico, who fell to 17-7-4 (10). Calderon waged a highly technical war in a bout which appeared difficult to score for clear reasons. Iribe threw a huge number of punches, and came forward all night as the aggressor. Calderon landed the only punches of consequence but unlike Manny Pacquiao versus Joshua Clottey, Iribe's punches did not hit anything, and appeared slow moving. Calderon was content to move left to right landing effective jabs and stayed away from the larger, taller Iribe, who had a reach advantage but lacked Calderon's hand speed. Calderon fought smart, keeping a distance the entire bout and out of range from Iribe, who landed a few effective power shots here and there, but no jabs of consequence. Iribe scored a flash knockdown of Calderon with an overhand right in round two, which served the Calderon camp notice that the remainder of the bout would have to be fought on the outside while on the move. The bout appeared quiet and unexciting, prompting the crowd to boo at times. Calderon's wife, sister, and brother-in-law 'Ziggy' were seated near SaddoBoxing and all agreed Calderon landed more blows. Neither fighter was marked on in trouble during the twelve round title bout. Calderon opened up and landed some heavier shots in the twelfth, which appeared his best round of an otherwise uneventful fight. Iribe, for his part, looked and fought like a pint-sized version of welterweight David Estrada, and his record appeared deceiving. Scoring: 116-11 twice and 118-109 for Calderon. 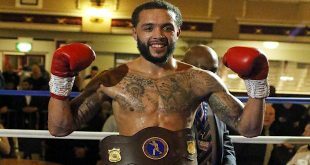 Referee: Benji Esteves Jr.
Brooklyn's Gabriel Bracero improved to 10-0 with a unanimous six round decision over Julius Edmonds of Philadelphia, Pennsylvania, in a six round super lightweight bout which was highly competitive. Bracero, a technical fighter with a phenomenal jab but no knockouts, went to work right away, scoring left hand jabs at will to win all six rounds in a runaway. Edmonds, an unorthodox fighter who hit harder than Bracero, came forward putting on pressure and walked into the left jab all night. Edmonds held his left low, and also got hit by some counter rights. Edmonds landed some counters effectively in the first three rounds as Bracero also held his left low at times. Edmonds continued throwing punches for all six rounds, not landing much, but was able to take a great shot, and fearlessly came to fight. Bracero appeared to settle down and go to work in rounds four through six, outpointing his opponent, not trying to punch himself out. Bracero hit Edmonds with many overhand rights countering over the Edmonds left, but failed to follow up with a left hook to take his opponent out, as his left foot was not outside the fighter's right for most of the bout to capitalize the advantage. This meant he had to work a lot harder to score a win which could have ended much earlier. In the post fight interview, Bracero explained, "Edmonds was trying to put pressure on me, and jumped into a lot of punches. He was holding everything down and making me work. For a couple of rounds, I was working too hard. "My corner told me to relax and stand behind the jab. Within the last month, I was working on the jab John Schaeffer taught me. In the third, I realized I could win the fight jabbing alone. So I stuck to the basics, 1-2-3 jab, the right hook and try to get in the uppercut." According to trainer John Schaeffer, "We're going to work on his balance and his legs, sit on his punches and develop power. With some adjustments, he'll make a run at a world title." Scoring: 60-54 across the board for Bracero. Referee: Danny Schiavone. In other bouts, Super Welterweight Glen Tapia of Passaic, New Jersey, went to 7-0 (5), scoring a second round stoppage of Nick Runningbear of Bismarck, North Dakota, now 4-3 (1). After an even first, Tapia patiently landed jabs and counter jabs on his less skilled opponent, who began to tire. Tapia scored a knockdown with an accumulation of jabs. Runningbear got up, but had a defeated and frightened look in his eye. A flurry of Tapia head punches caused referee Gary Rosato to stop the contest at 1:36 on the second round. According to Tapia in a post fight interview, "I've sparred Yuri Foreman, Alfredo Angulo, Joshua Clottey, I've sparred every kind of guy. I don't care who's in there, I go in there and work, that's how I fight!" 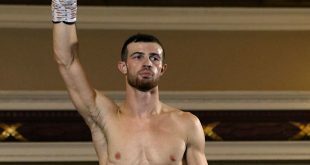 Will Rosinsky of Queens, New York, improved to 11-0 (7), with a third round stoppage of Angel Gonzalez of Puerto Rico, in a light heavyweight contest. Gonzalez, now 6-8-1 (3), ate a lot of uppercuts from Rosinsky in rounds one and two, and a lot of jabs in round three. After three rounds of punishment, an outmatched Gonzalez gave up on his stool, but he wasn't hurt. 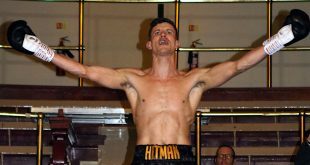 "I didn't think he was gonna retire after three rounds, he was strong all the way through; I felt real good tonight, the jabs got to his head," said Rosinsky in the post fight interview. Originally scheduled at 172-175 pounds, Rosinsky fought at 180. "I'm better at 168. I doubt I'll fight this heavy again. I just got my E.M.T. license, I can beat'em and treat'em!," joked Rosinisky. 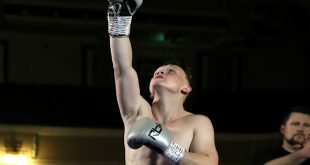 After a magnificent display of soldiers, flags, banners and guns, the dream of Steve Badgley of Fort Drum, Watertown, New York, was shattered in his professional debut at light heavyweight when Carlito Gonzalez, 0-2, of Yonkers, New York ended his night early. The bout started out strange, with Gonzalez twisting his ankle and going down in the first fifteen seconds during the opening exchange. Gonzalez got up and bravely fought on, and with substantial reach and height advantage over the shorter Badgley, went toe-to-toe and dropped Badgley with combinations. Badgley got up, and Gonzalez dashed right in and finished him, knocking him out cold. Time: 1:55 of the first round. Referee: Gary Rosato. Unknown Takashi Okada of Sakamihara, Japan, scored a unanimous decision upset over McWilliams Arroyo of Fajardo, Puerto Rico in a four rounder. Okada, now 2-0-1 (1), decked Arroyo, now 2-1 (2), with a right hand in round two and won the bout. A toe-to-toe world class war which surprised all, Okada won rounds one and two, Arroyo rounds three and four, both men grappling and fighting on the inside all over the ring and trading power shots. Okada traveled a very long way for the opportunity to get signed by Top Rank, and did well against an unbeaten prospect and legitimate 2008 Olympian. Scoring: 39-36 and 38-37 twice for Okada. Referee: David Fields. Special thanks for a complimentary ringside seat provided by Top Rank through Gabriel 'Tito' Bracero, one of the fighters on the undercard, and his Pennsylvania trainer John Schaeffer.